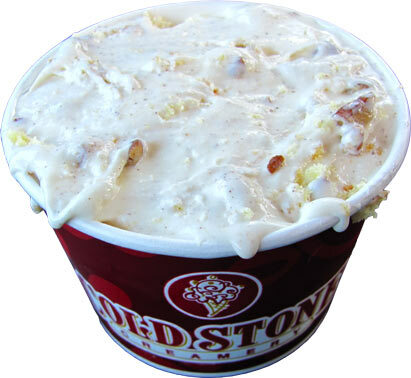 [By Nick] It's been awhile since we covered one of Cold Stone's Signature Creations. Let's take a look at one of the most recommended of the bunch. The name of this flavor is one of my favorites but a bit misleading. While it sounds like it's going to be a cinnamon roll flavor, the description talks about it being mind blowing with the mix of two different cake components. Either way, pecans and cinnamon are involved so I have a feeling I'm going to quite enjoy this one. There's actually a strong, cake smell coming from this creation. The cinnamon is present as well in the smell which is a good thing. Taking my first bite, this one tastes really familiar. I can't quite put my tongue on it...Oh wait, I got it. This tastes a lot like a cinnamon dunkaroo pack! Oh man, oh man. This is my childhood right here. The cake chunks don't quite give the same feeling you'd get from dunkaroos but they work great with the cinnamon frosting like base. They're not dry either which is always the main downfall of cake mix-ins. Dear General Mills, please bring back dunkaroos to the states, thanks. Pretty sure BJ's and Dollar General sell Dunkaroos in the USA.